Los Angeles: Michael Jackson’s personal doctor was found guilty on Monday of involuntary manslaughter in the pop star’s drug-related death in 2009 but may not spend much time in jail. Dr Conrad Murray, 58, was led away in handcuffs after the jury in Los Angeles reached a unanimous verdict. Dozens of fans outside the court erupted in cheers and some burst into tears. Murray faces up to four years behind bars when he is sentenced on 29 November but may spend only months in Los Angeles’ overcrowded cells. Murray pleaded not guilty to giving the “Thriller" singer a fatal dose of the powerful anesthetic propofol -- normally used in surgery -- that was ruled the main cause of his death at the age of 50. Prosecutors argued Murray was grossly negligent in administering the propofol to help Jackson sleep. Defense lawyers claimed Jackson delivered the fatal dose to himself. 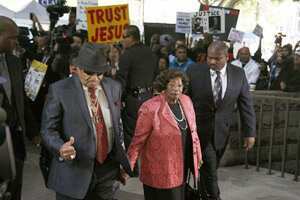 Michael Jackson’s parents Joe and Katherine Jackson arrive for the reading of the verdict in Dr. Conrad Murray’s trial in the death of pop star MichaelJackson in Los Angeles on 7 November 2011 . Reuters. Jackson was found lifeless at his Los Angeles mansion on 25 June , 2009, about three weeks before he was due to begin a series of concerts in London aimed at returning him to the limelight after the humiliation of his 2005 trial and acquittal on child molestation allegations. Murray admitted giving Jackson a small dose of propofol to help him sleep. But his lawyers argued the singer was dependent on the drug and likely gave himself an extra, fatal dose -- and swallowed a handful of sedatives -- without Murray knowing. Murray’s lawyer J. Michael Flanagan was asked by reporters if he was disappointed and he replied: “Of course." Judge Michael Pastor said Murray was “now a convicted felon who has been deemed the causative factor in Michael Jackson’s death." “It’s pretty obvious by putting him in custody, which was the biggest surprise of the entire trial, that we’re probably looking at a sentence of three to four years," Stan Goldman, a professor at Loyola Law School, told Reuters. But he added: “I’d be surprised if a year from today Conrad Murray was still behind bars." Still, Jackson fans were overjoyed. On the street outside the court, more than 100 of them whooped with joy and chanted “Thank you judge" as the verdict was read live on television. Bus driver Dana Brenklin, 35, burst into tears. “Of course it’s not enough and it’s not going to bring back Michael. But for two years, I had a project, justice for Michael Jackson, and I got what I wanted," Brenklin said. “The prosecution did a great job of creating a portrait (of Murray) that asked ‘Is this how someone would have acted if he was responsible?´" said Marcellus McRae, a former federal prosecutor who is now a trial lawyer with the New York-based law firm Gibson Dunn.